Common Name: Rhubarb, Chinese rhubarb. Radix et Rhizoma Rhei is produced mainly in Qinghai and Sichuan provinces. The herb is dug in the late autumn when the stems and leaves begin to wither or in early spring before the plant begins to sprout, then dried and sliced. It is used unprepared, stir-baked with wine, carbonized, or processed by other methods. Meridians: Spleen, stomach, large intestine and liver. 1. Constipation: a) heat accumulated in constipationRhubarb (Dahuang) is used with Glauber's salt (Mangxiao) in the formula Da Chengqi Tang; b) cold accumulation in constipationRhubarb (Dahuang) is used with Prepared aconite root (Fuzi) and Dried ginger (Ganjiang) in the formula Wenpi Tang; c) constipation with heat accumulation and damage to yinRhubarb (Dahuang) is used with Fresh rehmannia root (Shengdihuang), Scrophularia (Xuanshen) and Ophiopogon root (Maidong) in the formula Zengye Chengqi Tang. 2. Extravasation due to heat in the blood manifested as vomiting with blood and epistaxis, or upward attack by pathogenic fire manifested as red, painful and swollen eyes, sore throat and painful and swollen gums. These two syndromes are treated by combining Rhubarb (Dahuang), Coptis root (Huanglian) and Scutellaria root (Huangqin) in the formula Xiexin Tang. 3. Stagnation of blood manifested as amenorrhea, postpartum retention of lochia, postpartum abdominal pain, abdominal masses and traumatic injury. Rhubarb (Dahuang) is used with Chuanxiong rhizome (Chuanxiong), Peach seed (Taoren), Safflower (Honghua) and Moutan bark (Mudanpi). 4. Boils, carbuncles and furuncles. 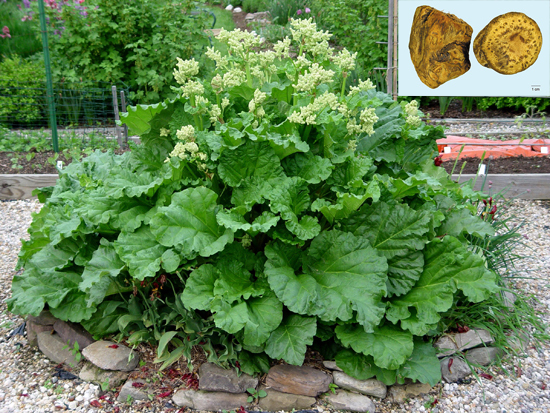 Rhubarb (Dahuang) is used with Peach seed (Taoren) and Moutan bark (Mudanpi). 1. 3-12 g, decocted in water for an oral dose. 2. Appropriate quantity for external use after grinding into powder. 3. The unprepared Radix et Rhizoma Rhei has drastic cathartic action, whereas the prepared has mild actions. For catharsis, it should be boiled later than other herbs or steeped in boiling water for an oral dose. To promote blood circulation, it should be used stir-baked with wine. To arrest bleeding, it should be carbonized. Cautions & Contraindications: The raw herb is strong in moving feces. Fried with wine, the herb is good for invigorating blood. The carbonized herb is applied during hemorrhagic disease. Overboiling of the herb weakens the function of purgation. This herb is contraindicated during menstruation and pregnancy.